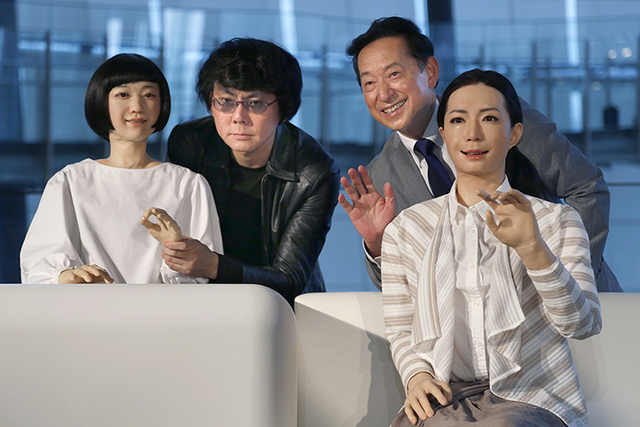 The new robot guides at a Tokyo museum, developed by Japanese robotics expert Hiroshi Ishiguro, look so eerily human and speak so smoothly they almost outdo people — almost. TOKYO — The new robot guides at a Tokyo museum look so eerily human and speak so smoothly they almost outdo people — almost. Japanese robotics expert Hiroshi Ishiguro, an Osaka University professor, says they will be useful for research on how people interact with robots and on what differentiates the person from the machine. In a demonstration, the remote-controlled machines moved their pink lips in time to a voice-over, twitched their eyebrows, blinked and swayed their heads from side to side. They stay seated but can move their hands. In a clear triumph, Kodomoroid read the news without stumbling once and recited complex tongue-twisters glibly. The robot, designed with a girlish appearance, can use a variety of voices, such as a deep male voice one minute and a squeaky girly voice the next. The speech can be input by text, giving them perfect articulation, according to Ishiguro. There were some glitches — such as the lips not moving at all while the robot spoke, or the Otonaroid announcer robot staying silent twice when asked to introduce itself. But glitches are common with robots because they are delicate gadgetry sensitive to their environment. Kodomoroid and the woman robot Otonaroid were joined at the demonstration by the minimally designed Telenoid, a mannequin head with pointed arms that serves as a cuddly companion. Reflecting widespread opinion, Ishiguro said Japan leads the world in playful companion robots. But he acknowledged the nation was behind the U.S. in military robots. Developing robots for more than 20 years, Ishiguro has made a point of creating robots that approximate the human appearance, including creatures that look like him. He has sent them to give overseas lectures. His approach differs from some robotics scientists who say human appearance is pointless, perhaps creepy, and robots can look like machines, such as taking the form of a TV screen or a portable device. Ishiguro noted proudly how Japanese Internet company Softbank Corp. recently showed a robot named Pepper, which looks a little like C-3PO in “Star Wars,” and will sell for less than 200,000 yen ($2,000). Pepper’s arrival means robots are increasingly becoming part of everyday life in Japan. 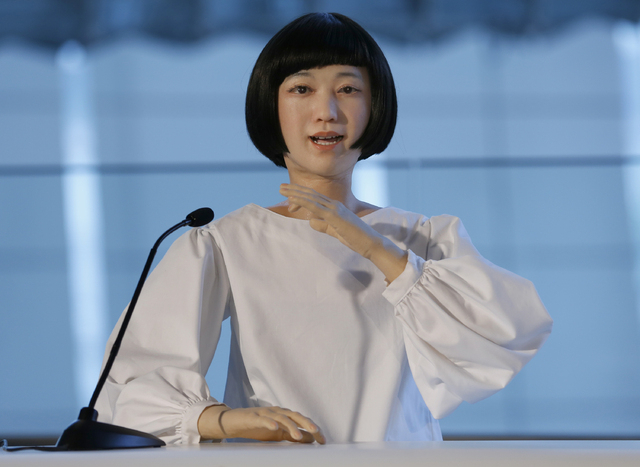 “Robots are now becoming affordable — no different from owning a laptop,” said Ishiguro.